Durban, 8 December 2018 - After five days of intense but always constructive discussions, the 7th session of the Meeting of the Parties to the Agreement on the Conservation of African-Eurasian Migratory Waterbirds (AEWA) has come to a successful conclusion in Durban, South Africa. The triennial Meeting of the Parties (MOP) is the Agreement’s principal decision-making body and among the main decisions taken in Durban were the adoption of the Strategic Plan and the Plan of Action for Africa for the period 2019-2027 as well as agreement on key species action plans focusing on some of the African-Eurasian flyway’s most charismatic and endangered waterbirds. With reference to the plan for Africa, Barirega Akankwasah, AEWA National Focal Point for Uganda and Vice-President of AEWA MOP7 said: “The AEWA Plan of Action for Africa presents a renewed framework for responding to contemporary waterbird conservation issues in Africa. 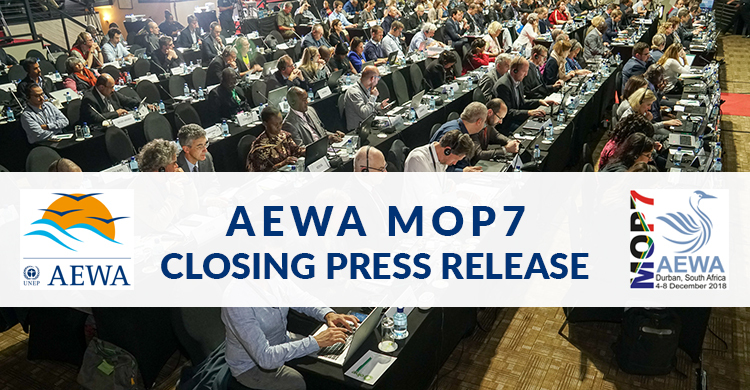 All AEWA contracting parties and partners should support its implementation. The Plan will undoubtedly improve the conservation status of waterbirds in Africa and across the Flyway”. MOP7 was held under the theme: “Beyond 2020: shaping flyway conservation for the future” and delegates considered reports on the conservation status of the species listed under the Agreement and the effects of plastic on waterbirds as well as prioritizing work on seabirds, thought to be among the most threatened groups of bird species in the world. Among the other Resolutions adopted included one on AEWA’s contribution to the Aichi Targets and the Agreement’s relevance to the Sustainable Development Goals, strengthening the monitoring of migratory waterbirds, guidance on the implementation of the AEWA Action Plan, climate resilient flyways, financial and institutional arrangements. “Among the many threats that waterbirds have to face are the effects of climate change as a key driver of species decline. We are working to make the flyway more resilient to climate change and of course we need everybody on board to fight against these effects not only on the habitats but on the birds themselves.” said Trouvilliez. In recognition of these efforts, the AEWA Waterbird Conservation Award was established in 2005 to recognize individuals, as well as government and non-government organizations and enterprises which have made a significant contribution towards the long-term conservation and sustainable use of waterbirds in the African-Eurasian region. Ohad Hatzofe, Avian Ecologist of the Israel Nature and Parks Authority, was declared the winner of the 2018 AEWA Conservation Award in the individual category, while the Egyptian Environmental Affairs Agency was successful in the institutional category. The awards were presented at a special ceremony on the opening day of the meeting, where David Stroud MBE, Senior Ornithologist at the Joint Nature Conservation Committee, was also declared Honorary Patron of the Agreement having been part of the bedrock of AEWA since its inception and having contributed widely to its development and implementation. Norway and the European Union were recognized as “Champions” of waterbird conservation, respectively for their support of the European Goose Management Programme and the AEWA African Initiative. Launched in 2014, the Migratory Species Champion Programme offers a portfolio of initiatives for donors willing to commit for three years or more to the implementation of a large programme targeting a species, a group of species or a cross-cutting issue. MOP7 attracted a total of 289 participants, including delegates representing 56 of the 78 Parties, 10 Non-Parties and 42 observers from NGOs, IGOs and the press, making this one of the largest such meetings in the Agreement’s history. The next Meeting of the Parties will be held in Hungary in 2021.